For patients at Henry Mayo, it was the smoothest of transitions moving to the hospital’s new and improved Infusion Center which opened its doors Feb. 18 at its new location at 23929 building (formerly called the F building), Suite #208. 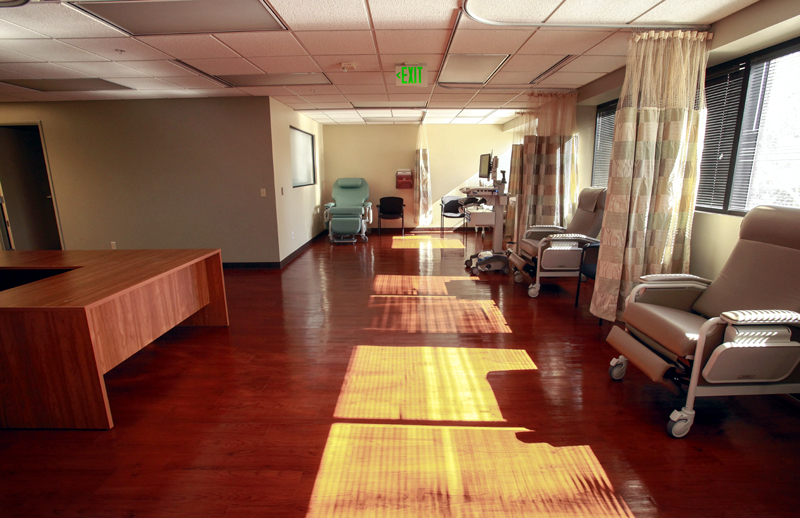 A 40 percent growth in infusion patients in the Henry Mayo Infusion Center in Fiscal Year 2012 clearly showed the need for an expanded facility. Patient well-being was the catalyst that drove improvements in infusion services which include a new 2,000-square-foot space equipped with eight new infusion chairs and staffed by two full-time RNs and a patient care tech. Everything was designed with the patient in mind, according to Donna Ferguson, RN, MBA, director of Infusion Services. From the soothing earth colors on the walls to the individual televisions to the separate refrigerator for patient meals, the new Infusion Center is designed to provide the best treatment in reduced-stress environment. Henry Mayo’s infusion services include chemotherapy, blood transfusions, and intravenous antibiotics. Treatment time ranges from 60 minutes to eight hours. Registered oncology nurses provide the full range of outpatient infusion services to individuals as prescribed by their physicians. * A comfortable consultation room that can be used for multiple purposes, including for physicians and nurses to meet privately with patients and families. * A patient intake process onsite that enhances privacy, confidentiality and time saving convenience. Henry Mayo Newhall Memorial Hospital is a 238-bed not-for-profit acute care hospital serving the Santa Clarita Valley since 1975. Services include trauma, emergency, intensive care, neonatal intensive care unit, maternity, surgery, nursing, wound care, behavioral health, and acute rehab, as well as cancer, cardiology, imaging, lab, digestive, respiratory services and physical and occupational therapies. Henry Mayo Newhall Memorial Hospital is located at 23845 McBean Parkway, Valencia, CA 91355-2083. For more information, visit www.henrymayo.com or call (661) 253-8000.